New Year Resolution: Lose Weight! I received a great question this week and thought I’d address it here this month since it’s the start of the New Year, when everyone is gearing up with their 2016 New Years Resolutions. Where do you get your motivation from and how do you maintain it to not only begin, but to keep up with the workouts? Everyone’s motivation for losing weight, working out and getting into shape will vary, but we all pretty much have the same goal in mind: being healthy. You may have a reason such as an upcoming wedding or class reunion where you want to look your best, or it could be something more serious like a doctors warning that you need to get healthier. Mine was the latter, I met with my doctor in late January 2015 and I was 415lbs and diagnosed with Type II diabetes, high blood pressure, and bad cholesterol levels. Just walking was an issue, because of bad knees and bouts with Gout in my foot. I was put on all the necessary medications to treat everything on a daily basis, but nothing was going to cure it. I was being pushed by my doctors to have gastric bypass surgery, and was considering having it done to get my life back. I then decided I wanted to give it a try on my own without having the surgery. I started with a nutritional program that opened my eyes and taught me so much about nutrition and supplementing our bodies with the right fuel (please email me or message me for specific details on the program). Seeing my progress every week gave me the motivation to keep going. Losing weight took my energy levels to new heights and I found myself actually wanting to go to the gym. Glad to say after 8 months I had lost over 90lbs and the doctor was happy and discontinued all the medications, so that was another motivation to keep me going. Getting my health back and being their for my nine year old daughter became my “WHY” and when your why is big enough, you will find your how. Some of the best ways to keep motivated is to find a friend to partner up with and workout together and by making the workouts fun, you will enjoy it together and help motivate each other. Make sure you always have a “before” picture, so you can always see how far you’ve come. Set and track goals it will help motivate you as you see your progress. Please stick it out, you didn’t gain the weight or become unhealthy overnight, don’t expect results to happen overnight. You may have a bad day or two, keep going, string a couple good days together, then stretch it to a week, then a month. Let the good days outweigh the bad days and you’ll be surprised at your thirty day results. And always: Think about why you started in the first place. 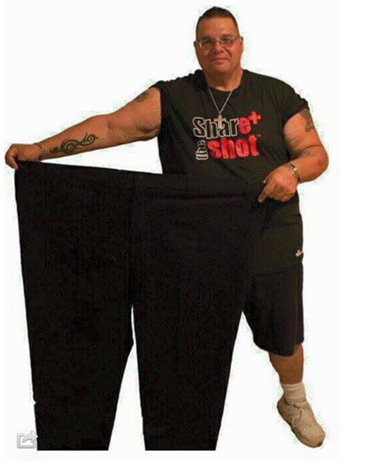 Rick Bellanti is a wellness coach and is on a journey himself to lose 240lbs, and has lost 120lbs since the start of 2015. If you have any questions or comments, please post them to his Getting Healthy with Rick Bellanti Facebook page and once a month, he will address a few of the topics here. 3 Responses to New Year Resolution: Lose Weight! Very inspiring Rick!!! Congrats on your success and your journey. You are so supportive of those that you can help. I don`t even think you realize how much you can inspire people to make the lifestyle changes they need.